The name Shams al-Dīn Muḥammad ibn Makkī occurs in a number of manuscripts as an author of short poems on various medical topics. The subjects of the poems include venesection, the evacuation of humors, and circumcision, all of which are represented by copies now at NLM. Nothing else is known of this medical writer. It is possible that he is related to a writer of didactic poems concerned with calendars by the name of Yūsuf Efendi al-‘Aqqad al-Makkī, whose dates are also unknown. For the latter, see David A. King, A Survey of the Scientific Manuscripts in the Egyptian National Library [American Research Center in Egypt, Catalog 5] (Winona Lake, Indiana: Eisenbrauns for the American Research Center in Egypt, 1986), p. 121 entry D160. The preserved manuscript copies of these medical poems by Shams al-Dīn Muḥammad ibn Makkī are all undated and appear to be from the 17th or 18th centuries. Consequently, it is likely that he lived before or in the early 17th century. This is a 20-line didactic poem on bloodletting techniques written in rajaz verse. Three other copies are recorded: London, Wellcome Library for the History and Understanding of Medicine, MS Arab. 129, fols. 33b-34a (see Iskandar, "Wellcome", pp. 213-4); Vatican, MS Borg. arab. 87, fols. 32a-32b (see G. Levi della Vida, Elenco dei manuscritti arabi islamici della Biblioteca Vaticana, Vaticani Barberiniani Borgiani Rossiani, Studi e Testi 67 (Vatican City, 1935), p. 255); and Cairo, Dar al-Kutub, MS Ta‘lat 606 tibb (see Salah al-Din al-Munajjid, "Masadir jadidah ‘an ta'rikh al-tibb ‘inda al-‘arab", Revue de l'Institut des Manuscrits Arabes, vol. 5 (1959), p. 330 no. 508). See also GAL-S vol. 2, p. 1030, no. 36.1. The beginning of a poem on the bloodvessels used in phlebotomy written by Ibn Makkī, of whom little is known. Undated copy, possibly 18th century. Arabic. 2 leaves (fols. 58b-59a). Dimensions 20 x 13.7 (text area approx 15.3 x 9) cm; 18 lines per page. The author is given on fol. 58b , line .3, as al-Shaykh Shams Muḥammad ibn Makkī. The title is given on the same folio, lines 2-3. The copy is undated; the general appearance of the script, ink, and paper suggests an 18th-century date. The same scribe copied all the items in the volume. A complete copy. The text is written in a medium-small naskh, inelegant and awkward but consistent, with some ligatures and some vocalization. The text area has been frame-ruled but the ruling was often not followed. Black ink has been used with the headings in red; the ends of stanzas are indicated by red dots. There are catchwords. This is a 12-line didactic poem on purging is written in rajaz verse. Two other copies are recorded: London, Wellcome Library for the History and Understanding of Medicine, MS Arab. 129, fols. 34a, lines 4-17 (see Iskandar, "Wellcome", pp. 207), and Vatican, MS Borg. arab. 87, fols. 32b-33a (see G. Levi della Vida, Elenco dei manuscritti arabi islamici della Biblioteca Vaticana, Vaticani Barberiniani Borgiani Rossiani, Studi e Testi 67 (Vatican City, 1935), p. 255). See also, GAL-S vol. 2, p. 1030, no. 36.2. Arabic. 1 leaf (fol. 59a). Dimensions 20 x 13.7 (text area approx 15.3 x 9) cm; 18 lines per page. The author is given on fol. 59a, line 18, as Ibn Makkī. The title is given on the same page, line 6. A complete copy. The text is written in a medium-small naskh, inelegant and awkward but consistent, with some ligatures and some vocalization. The text area has been frame-ruled but the ruling was often not followed. Black ink was used with the headings in red; the ends of stanzas are indicated by red dots. There are catchwords. This is a 30-line didactic poem on purging is written in rajaz verse. In the copy at NLM the author is not named, but the poem is identical to that preserved in two other manuscripts where Ibn Makkī is designated as its author. The other two known copies are: London, Wellcome Library for the History and Understanding of Medicine, MS Arab. 129, fols. 34a, line 18, to 35a, line 9, where Ibn Makkī is specified as the author (see Iskandar, "Wellcome", pp. 208), and Vatican, MS Borg. arab. 87, fols. 33a-33b (see G. Levi della Vida, Elenco dei manuscritti arabi islamici della Biblioteca Vaticana, Vaticani Barberiniani Borgiani Rossiani, Studi e Testi 67 (Vatican City, 1935), p. 255). Arabic. 2 leaves (fols. 59b-60a). Dimensions 20 x 13.7 (text area approx 15.3 x 9) cm; 18 lines per page. The author's name is not given in this copy. The title is given on fol. 59b line 2. All three of these poems by Ibn Makkī were copied by the same copyist in one album of medical poetry. The cream, semi-glossy paper has laid lines, single chain lines, and is watermarked; it is wormeaten (some repairs), and the edges have been trimmed from their original size. The volume consists of 60 leaves and contains eight items of medical poetry, all transcribed by the same copyist. Item 1 (fols. 1a-47b) is the famous Urjūzah by Ibn Sīnā (MS A 34, item 1); items 2, 3, and 4 are three other medical poems by Ibn Sīnā (MS A 34, item 2) (MS A 34, item 3) (MS A 34, item 4); item 5 (fols. 58b-59a), item 6 (fol. 59a), and item 7 (fols. 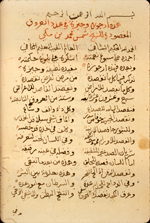 59b-60a) are the three medical poems by Ibn Makkī here catalogued; and item 8 (fol. 60b) is a fragment of a versification, often attributed to Ibn Sīnā, of a pseudo-Hippocratic treatise on prognostics (MS A 34, item 8). The table of contents on fol. 1a indicates that at one time these poems were bound together with a poem on anatomy by Ibn Sīnā and a treatise on bloodletting by Ibn Tilmīdh. The contents and order of MS A 34 follow very closely that of a manuscript in London at the Wellcome Library for the History and Understanding of Medicine, MS Arab. 129, which is also undated and probably of the 17th-18th century, as well as an undated 17th-century manuscript in the Vatican, MS Borg. arab. 87. 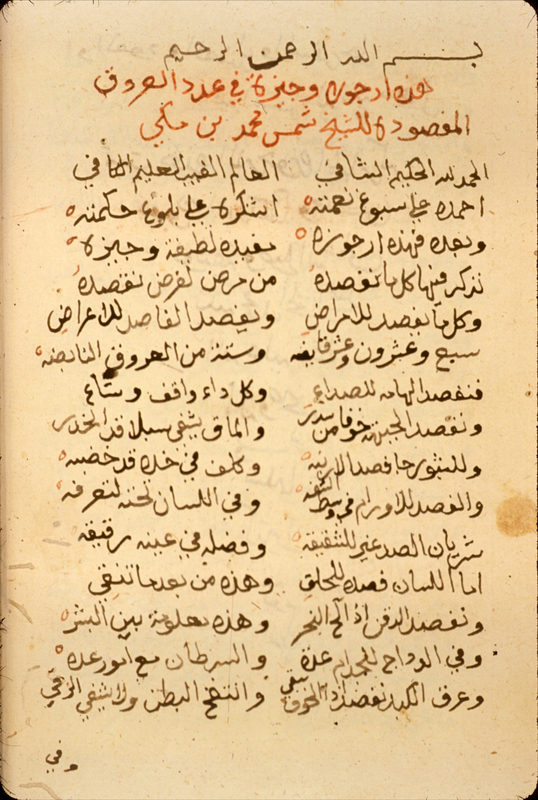 The Wellcome manuscript contains all the poems in the same sequence that are in the NLM manuscript, plus the poem on anatomy by Ibn Sīnā as well as the treatise by Ibn Tilmīdh. The Vatican manuscript has the poem on anatomy by Ibn Sīnā and all the poems in the NLM copy with one exception: the second item in the Vatican manuscript is a poem on pulse and urine, as in the NLM manuscript, but it is a different poem from that found in either the NLM or the Wellcome manuscripts. The binding is red leather over pasteboards, with envelope flap; a modern library binding. The endpapers and pastedowns are modern. Purchased in 1941 by the Army Medical Library from A. S. Yahuda (ELS 1709 Med. 70). Schullian/Sommer, Cat. of incun. & MSS., p. 304-305, A 34. NLM Microfilm Reel: FILM 48-119 no. 1 .